My first few days of school are filled with team building activities and STEM activities. Practicing teamwork and perseverance is really important in my classroom. STEM stands for Science, Technology, Engineering, and Math. 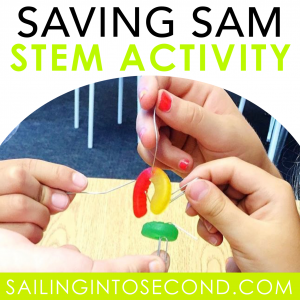 Today I’ll be sharing one of my favorite STEM activities called Saving Sam or Save Fred. The Saving Sam STEM challenge is perfect for getting students to collaborate and work together to solve the problem. You could even use this for a staff collaboration activity or as an activity throughout the year like after fall or winter break. 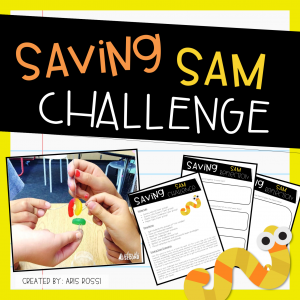 Here’s the basic idea behind this activity, students must work together to save Sam, a worm who’s row boat has capsized and can’t swim without his life preserver. 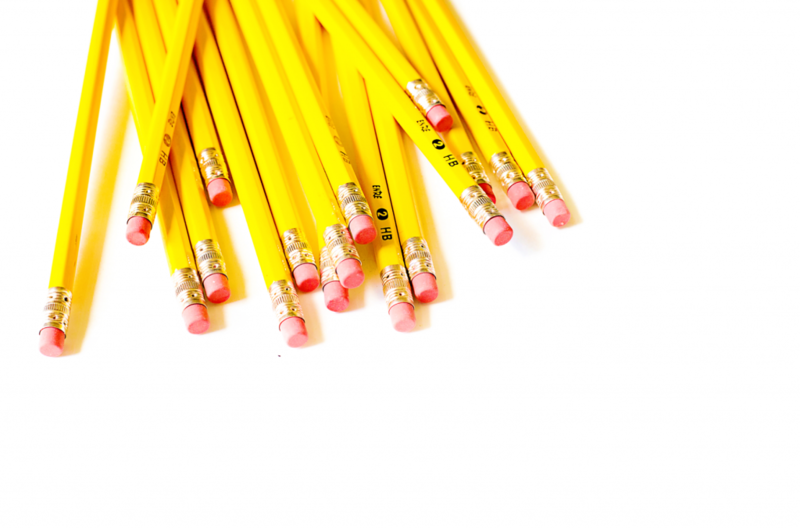 Once you’ve passed out the materials to each group, split students into groups of 4 (or smaller). Then take the life preserver (gummy life saver) and place it under the plastic sauce container. Next, put the gummy worm (Sam) on top of the upside down sauce container. It represents the capsized boat and the life preserver underneath the boat. Read the “Saving Sam” scenario and go over challenge rules. Lastly, watch your students have fun! I have my students reflect on teamwork and successful team strategies using a reflection form but that can be optional. You can have a whole group or class discussion too. My students LOVED this activity, even if they didn’t succeed in saving poor Sam! Does this sound like an awesome activity you’d like to try with your kids?? Just drop your name and personal email address in the contact box at the end of this post and I’ll send them over to you right away into your inbox! This STEM download includes directions, material list, teacher script and inquiry questions needed to complete the challenge! YAY!